I was asked recently on Twitter to better explain Podman and Buildah for someone familiar with Docker. Though there are many blogs and tutorials out there, which I will list later, we in the community have not centralized an explanation of how Docker users move from Docker to Podman and Buildah. Also what role does Buildah play? Is Podman deficient in some way that we need both Podman and Buildah to replace Docker? This article answers those questions and shows how to migrate to Podman. Ask the kernel to run a container with the right namespace and cgroup, etc. 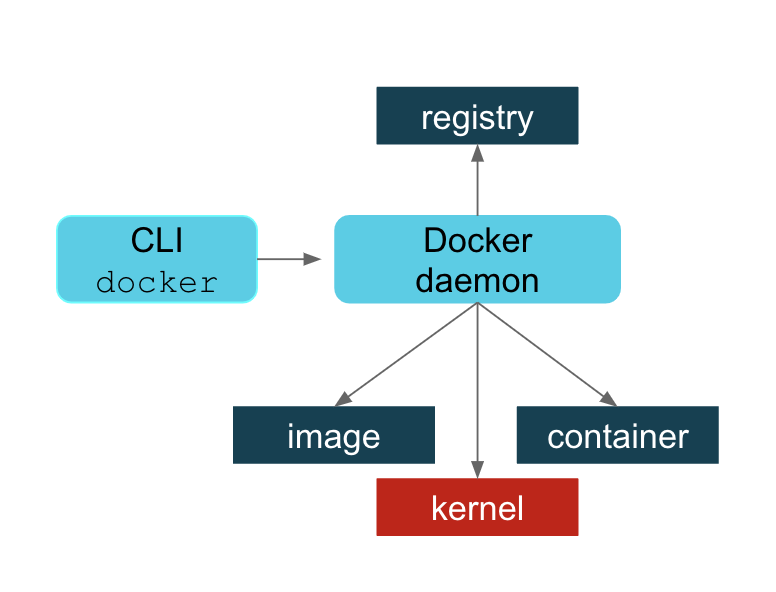 Essentially the Docker daemon does all the work with registries, images, containers, and the kernel. The Docker command-line interface (CLI) asks the daemon to do this on your behalf. A single process could be a single point of failure. This process owned all the child processes (the running containers). If a failure occurred, then there were orphaned processes. Building containers led to security vulnerabilities. All Docker operations had to be conducted by a user (or users) with the same full root authority. There are probably more. Whether these issues have been fixed or you disagree with this characterization is not something this article is going to debate. We in the community believe that Podman has addressed many of these problems. If you want to take advantage of Podman’s improvements, then this article is for you. 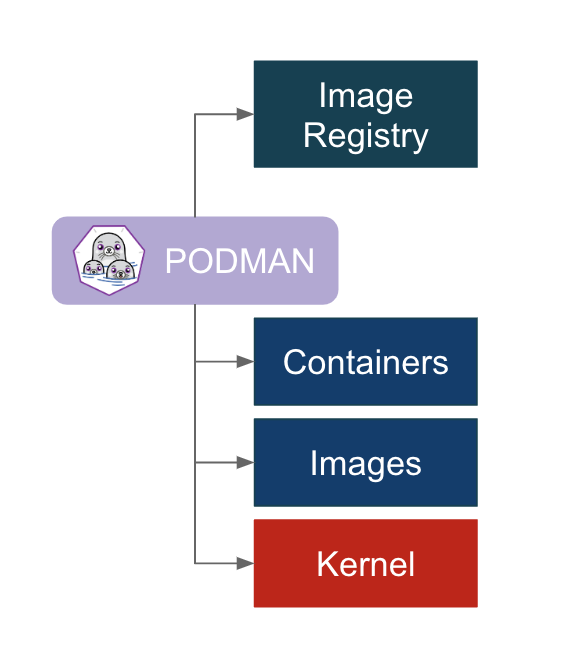 The Podman approach is simply to directly interact with the image registry, with the container and image storage, and with the Linux kernel through the runC container runtime process (not a daemon). You install Podman instead of Docker. You do not need to start or manage a daemon process like the Docker daemon. The commands you are familiar with in Docker work the same for Podman. Podman stores its containers and images in a different place than Docker. Podman and Docker images are compatible. Podman does more than Docker for Kubernetes environments. What is Buildah and why might I need it? If you are using Docker today, you can remove it when you decide to make the switch. However, you may wish to keep Docker around while you try out Podman. There are some useful tutorials and an awesome demonstration that you may wish to run through first so you can understand the transition more. One example in the demonstration requires Docker in order to show compatibility. When building Podman, the goal was to make sure that Docker users could easily adapt. So all the commands you are familiar with also exist with Podman. In fact, the claim is made that if you have existing scripts that run Docker you can create a docker alias for podman and all your scripts should work (alias docker=podman). Try it. Of course, you should stop Docker first (systemctl stop docker). There is a package you can install called podman-docker that does this for conversion for you. It drops a script at /usr/bin/docker that executes Podman with the same arguments. The commands you are familiar with—pull, push, build, run, commit, tag, etc.—all exist with Podman. See the manual pages for Podman for more information. One notable difference is that Podman has added some convenience flags to some commands. For example, Podman has added --all (-a) flags for podman rm and podman rmi. Many users will find that very helpful. You can also run Podman from your normal non-root user in Podman 1.0 on Fedora. RHEL support is aimed for version 7.7 and 8.1 onwards. Enhancements in userspace security have made this possible. Running Podman as a normal user means that Podman will, by default, store images and containers in the user’s home directory. This is explained in the next section. For more information on how Podman runs as a non-root user, please check out Dan Walsh’s article: How does rootless Podman work? When you first type podman images, you might be surprised that you don’t see any of the Docker images you’ve already pulled down. This is because Podman’s local repository is in /var/lib/containers instead of /var/lib/docker. This isn’t an arbitrary change; this new storage structure is based on the Open Containers Initiative (OCI) standards. In 2015, Docker, Red Hat, CoreOS, SUSE, Google, and other leaders in the Linux containers industry created the Open Container Initiative in order to provide an independent body to manage the standard specifications for defining container images and the runtime. In order to maintain that independence, the containers/image and containers/storage projects were created on GitHub. Since you can run podman without being root, there needs to be a separate place where podman can write images. Podman uses a repository in the user’s home directory: ~/.local/share/containers. This avoids making /var/lib/containers world-writeable or other practices that might lead to potential security problems. This also ensures that every user has separate sets of containers and images and all can use Podman concurrently on the same host without stepping on each other. When users are finished with their work, they can push to a common registry to share their image with others. Docker users coming to Podman find that knowing these locations is useful for debugging and for the important rm -rf /var/lib/containers, when you just want to start over. However, once you start using Podman, you’ll probably start using the new -all option to podman rm and podman rmi instead. Despite the new locations for the local repositories, the images created by Docker or Podman are compatible with the OCI standard. Podman can push to and pull from popular container registries like Quay.io and Docker hub, as well as private registries. For example, you can pull the latest Fedora image from the Docker hub and run it using Podman. Not specifying a registry means Podman will default to searching through registries listed in the registries.conf file, in the order in which they are listed. An unmodified registries.conf file means it will look in the Docker hub first. Podman provides some extra features that help developers and operators in Kubernetes environments. There are extra commands provided by Podman that are not available in Docker. If you are familiar with Docker and are considering using Kubernetes/OpenShift as your container platform, then Podman can help you. Podman can generate a Kubernetes YAML file based on a running container using podman generate kube. The command podman pod can be used to help debug running Kubernetes pods along with the standard container commands. For more details on how Podman can help you transition to Kubernetes, see the following article by Brent Baude: Podman can now ease the transition to Kubernetes and CRI-O. What is Buildah and why would I use it? Buildah actually came first. And maybe that’s why some Docker users get a bit confused. Why do these Podman evangelists also talk about Buildah? Does Podman not do builds? Podman does do builds and for those familiar with Docker, the build process is the same. You can either build using a Dockerfile using podman build or you can run a container and make lots of changes and then commit those changes to a new image tag. Buildah can be described as a superset of commands related to creating and managing container images and, therefore, it has much finer-grained control over images. Podman’s build command contains a subset of the Buildah functionality. It uses the same code as Buildah for building. The most powerful way to use Buildah is to write Bash scripts for creating your images—in a similar way that you would write a Dockerfile. I like to think of the evolution in the following way. When Kubernetes moved to CRI-O based on the OCI runtime specification, there was no need to run a Docker daemon and, therefore, no need to install Docker on any host in the Kubernetes cluster for running pods and containers. Kubernetes could call CRI-O and it could call runC directly. This, in turn, starts the container processes. However, if we want to use the same Kubernetes cluster to do builds, as in the case of OpenShift clusters, then we needed a new tool to perform builds that would not require the Docker daemon and subsequently require that Docker be installed. Such a tool, based on the containers/storage and containers/image projects, would also eliminate the security risk of the open Docker daemon socket during builds, which concerned many users. Buildah (named for fun because of Dan Walsh’s Boston accent when pronouncing “builder”) fit this bill. For more information on Buildah, see buildah.io and specifically see the blogs and tutorials sections. It allows for finer control of creating image layers. This is a feature that many container users have been asking for for a long time. Committing many changes to a single layer is desirable. Buildah’s run command is not the same as Podman’s run command. Because Buildah is for building images, the run command is essentially the same as the Dockerfile RUN command. In fact, I remember the week this was made explicit. I was foolishly complaining that some port or mount that I was trying wasn’t working as I expected it to. Dan (@rhatdan) weighed in and said that Buildah should not be supporting running containers in that way. No port mapping. No volume mounting. Those flags were removed. Instead buildah run is for running specific commands in order to help build a container image, for example, buildah run dnf -y install nginx. Buildah can build images from scratch, that is, images with nothing in them at all. Nothing. In fact, looking at the container storage created as a result of a buildah from scratch command yields an empty directory. This is useful for creating very lightweight images that contain only the packages needed in order to run your application. 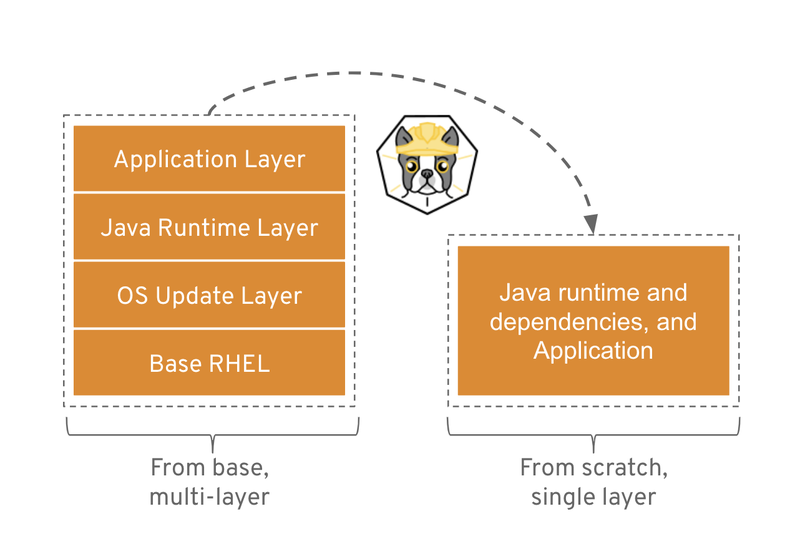 A good example use case for a scratch build is to consider the development images versus staging or production images of a Java application. During development, a Java application container image may require the Java compiler and Maven and other tools. But in production, you may only require the Java runtime and your packages. And, by the way, you also do not require a package manager such as DNF/YUM or even Bash. Buildah is a powerful CLI for this use case. See the diagram below. For more information, see Building a Buildah Container Image for Kubernetes and also this Buildah introduction demo. Getting back to the evolution story…Now that we had solved the Kubernetes runtime issue with CRI-O and runC, and we had solved the build problem with Buildah, there was still one reason why Docker was still needed on a Kubernetes host: debugging. How can we debug container issues on a host if we don’t have the tools to do it? We would need to install Docker, and then we are back where we started with the Docker daemon on the host. Podman solves this problem. Podman becomes a tool that solves two problems. It allows operators to examine containers and images with commands they are familiar with using. And it also provides developers with the same tools. So Docker users, developers, or operators, can move to Podman, do all the fun tasks that they are familiar with from using Docker, and do much more. I hope this article has been useful and will help you migrate to using Podman (and Buildah) confidently and successfully. RHEL is known as the popular enterprise deployment platform, but it's a great agile platform for building hybrid applications – across cloud, physical, virtual, and container-centric infrastructures - using the latest development tools.